Abstract: Diesel engine technology is still the most effective solution to meet tighter CO2 regulations in the mobility and transport sector. In implementation of fuel-efficient diesel engines, the poor thermal durability of lean nitrogen oxides (NOx) aftertreatment systems remains as one major technical hurdle. Here, divalent copper ions when “fully exchanged” into high-silica LTA zeolites are demonstrated to exhibit excellent activity maintenance for NOx reduction with NH3 under vehicle simulated conditions even after hydrothermal aging at 900 °C – a critical temperature that the current commercial Cu-SSZ-13 catalyst cannot overcome due to thermal deactivation. Detailed structural characterizations confirm the presence of Cu2+ ions only at the center of single 6-rings that act not only as a catalytically active center, but also as a dealumination suppressor. The overall results of our work renders the copper-exchanged LTA zeolite attractive as a viable substitute for Cu-SSZ-13. 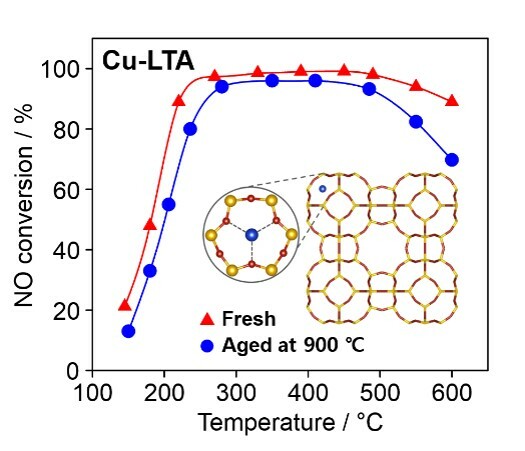 Age doesn’t matter: Fully copper-exchanged high-silica LTA zeolites show unprecedented activity for selectively reducing NOx with ammonia, even after hydrothermal aging at 900 °C. Si yellow, O red, Cu blue.